I just love meringues so I wanted to re-share this recipe to my own blog, you can also find it on my sister’s blog The Western Wild, which you must be sure to check out if you haven’t already, she writes about everything from fashion & love to travel & food. What is meringue? Meringue is a lovely French dessert and all it consists of is egg whites, sugar, a little cream of tartar and air! I love making meringues and experimenting with flavors. I chose chocolate for this recipe because, lets face it, it’s sort of hard to beat… adding espresso makes these meringues that much more sophisticated and yummy. These are easy to make but just be sure you have a few hours available to be around your oven between prep and cooling time. Lets get started by preheating your oven to 200 degrees. Beat your room temperature egg whites with a mixer on low speed until they begin to foam. Next sprinkle in the cream of tartar. 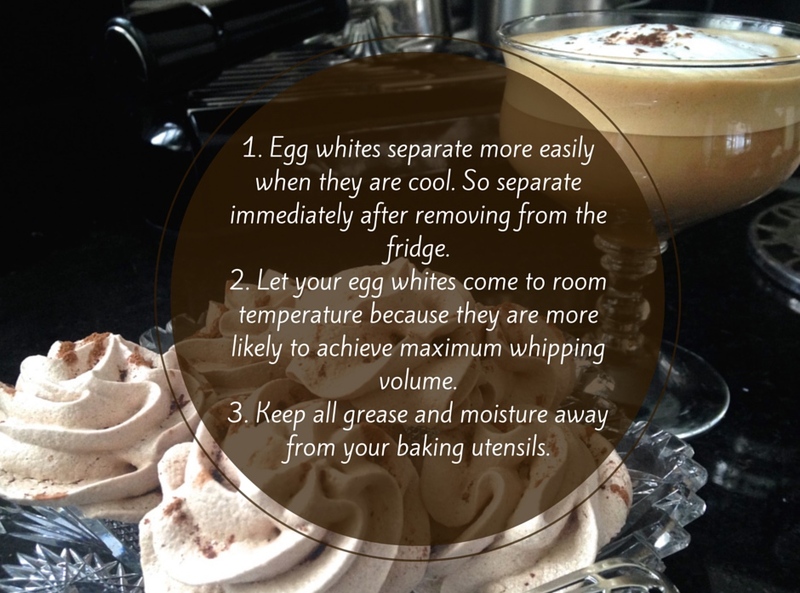 Increase speed until your egg whites reach the soft peak stage (the eggs will thicken, but will not be to a point where they can hold a peak). Keep at a medium-high speed and gradually add the sugar- it took me about 1 minute to add all the sugar because I wanted each scoop of sugar to be fully dissolved before adding the next one. After you have added the sugar you will notice your egg whites have gone from being a matte foam to a thick glossy consistency. If you turn off your mixer and lift the whisk you will see that your eggs have reached the “stiff peaks” stage (see peak stages below), meaning the meringue will hold a peak. This is the point at which you want to turn your mixer back on at a low-medium speed, add your dash of salt, espresso, and 2 tablespoons of cocoa. Use a rubber spatula to fill a piping bag with the meringue (a ziplock bag will do the trick (just cut the corner off the bottom), you can also simply spoon them out). Pipe onto parchment paper lined baking sheet. Dust the remaining 1/4 teaspoon of cocoa over the meringues. Bake your meringues for an hour and a half. Turn the oven off but leave them in the oven to dry for another hour and a half (this is to prevent the meringues from cracking). Once you remove them from the oven let them cool completely before serving. I like to serve these with an espresso or latte. I hope you give this a try because meringues really are fun to make… and lets be honest, to eat! Enjoy!